Team BLACK FALCON have begun 2018 in the best possible fashion, taking first place overall in the 24 Hours Dubai. 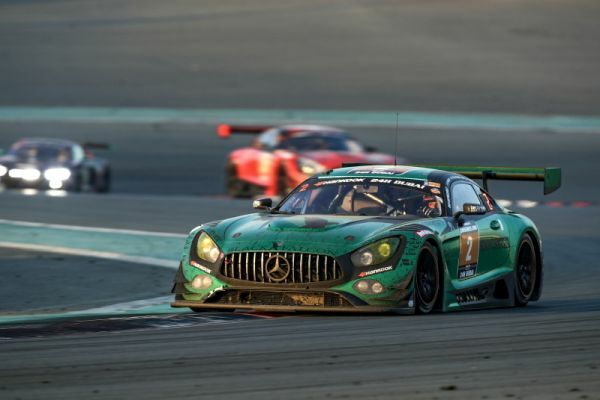 This year’s win – achieved in dominating style by the star line-up of Abdulaziz Al Faisal (Saudi Arabia), Hubert Haupt (Germany), Yelmer Buurman (Netherlands) and Gabriele Piana (Italy) in their Mercedes-AMG GT3 – brings the team’s tally of results in this gruelling endurance marathon to an impressive four victories since 2011, plus four further podium finishes. Abudulaziz, Hubert and Yelmer celebrated repeat wins in Dubai, with new team-mate Gabriele picking up his first winner’s trophy in the UAE. Team BLACK FALCON entered three Mercedes-AMG GT3s in the headline A6 category for GT3-specification racecars, along with an example of the new Mercedes-AMG GT4 that the team had been developing during 2017. The three GT3s featured matching Black Falcon liveries for the race, the stunning machines differentiated by their base colours. The metallic-green A6-Pro #2 GT3 featured Abdulaziz Al Faisal (Saudi Arabia), Hubert Haupt (Germany), Yelmer Buurman (Netherlands) and Gabriele Piana (Italy). Local star Khaled Al Qubaisi (UAE) drove the second GT3 entry, red #3 in A6-Pro, alongside Jeroen Bleekemolen (Netherlands), Luca Stolz (Germany) and Manuel Metzger (Germany), while the roster for the silver A6-Am #7 GT3 included Kriton Lendoudis (Greece), FIA WEC GTE Am champion Rui Aguas (Portugal), Saud Al Faisal (Saudi Arabia) and Saeed Al Mouri (Saudi Arabia). Entered under the BLACK FALCON Team TMD Friction banner, the drivers for the #264 Mercedes-AMG GT R SP-X were Kevin Wing Kin Tse (Macau), Frank Yu (Hong Kong), Jonathan Hui (Hong Kong) and Antares Au (Hong Kong). The team were also supporting the #233 Mercedes-AMG GT4 entry of Besagroup Racing. The opening sessions boded well for the team, with Khaled topping the GT-only Free Practice 2 to lead a fantastic Team BLACK FALCON 1-2. The Emirati driver set the pace in #3, just pipping the sister #2 car in the dying moments of the session. 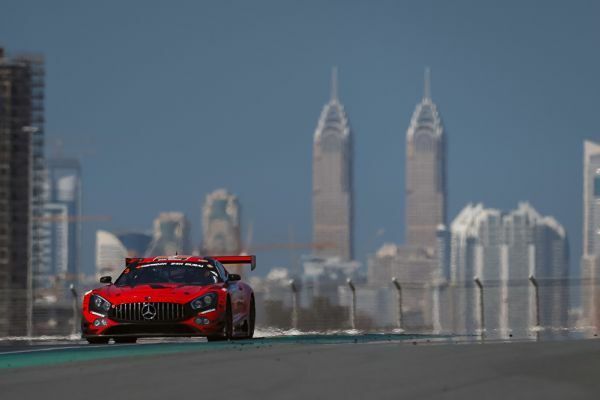 The team continued to perform well in the combined practice session that followed, showing that the Mercedes-AMG GT3 was the car to have at the Dubai Autodrome – although lap-times throughout the GT3 grid were incredibly tight. In GT4, the team’s Mercedes was also going well, setting the third quickest lap. That speed was carried through into Qualifying, Jeroen setting a time in #3 that was only fractionally off pole position – just 0.035 seconds slower – to take second on the grid, with #2 taking a strong third for the start. #7 lined up 13th, less than a second from overall pole, solidly in the middle of the A6-Am runners and seventh in class. #264 took 10th in GT4, with the Besagroup entry second in class. 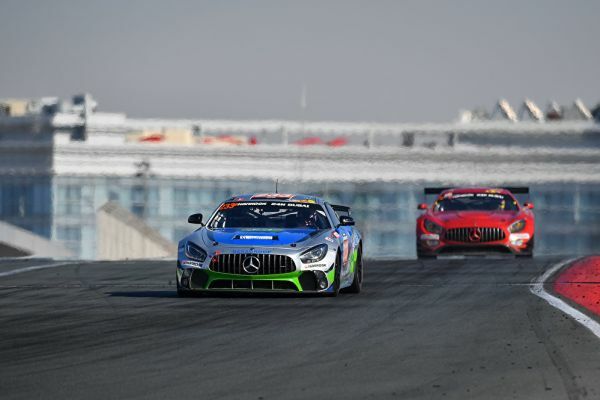 Following the mass rolling start for the 89 entries under the warm desert sun at 14:00 on Friday, the first hour went perfectly for the #3 Mercedes-AMG GT3. Jeroen aced the start, to shadow the pole-sitting Lamborghini through the opening phase of the race: this put him in the perfect position to pounce when the leader suffered a puncture. 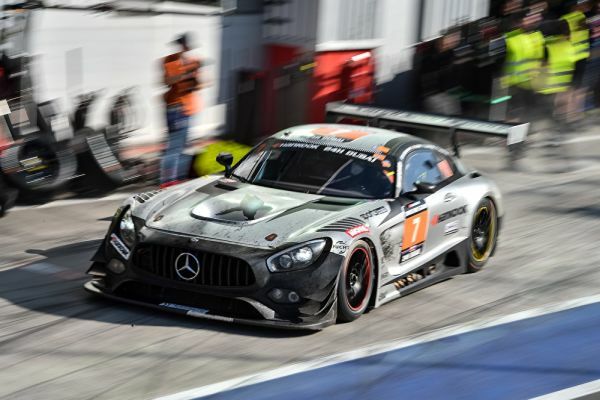 However, it was a different story for the #7 car, as a collision with a Porsche around the busy track forced Rui to pit his Mercedes with front-end bodywork and a broken steering rack. The Team BLACK FALCON pit-crew got straight to work, and although #7 was able to temporarily rejoin, unfortunately Rui was soon back in the pits. Further repairs were required that would take the car out of the race for several hours, but the Team BLACK FALCON mechanics worked furiously to fix the damage so the #7’s drivers could later get back out on track. At the end of the first hour, #3 led overall, with #2 temporarily back in 21st after pitting. The BLACK FALCON Team TMD Friction-supported Besagroup Mercedes-AMG GT4 led the GT4 class, with #264 already up to fifth in that class. As the evening wore on and darkness rapidly descended over the desert, #3 would continue to be at the sharp end of the race with Manuel behind the wheel and within touching distance of the lead. Gabriele was also running strongly in the top 10 in #2, up to third behind #3 at the end of the fourth hour of racing, and the hard work of the mechanics was rewarded as Kriton returned #7 to the track. The drivers of #264 were also putting in a great performance, improving hour after hour to be second in GT4 as night drew in and the fireworks exploded over the circuit, fighting hard to close the gap to the class leader. Just before midnight, the relentless pressure put on the leading Porsche by the drivers of #2 and #3 paid off, with the two Mercedes leapfrogging ahead to run first and second throughout the night. Dawn broke with the two Team BLACK FALCON Mercedes still leading, but there was heartbreak for the #3 crew in the mid-morning, as on the lap 502 Luca was involved with a collision on the fast main straight with another GT3 car, causing damage that took the Mercedes out of the race. It was massively disappointing after such a stellar performance by the car’s four drivers, and left #2 to battle on alone to the flag. #2’s drivers dug deep and pressed on to take a stunning victory, two laps clear of the second-placed Porsche by the end, with Team BLACK FALCON’s Mercedes having led well over half the race: 369 laps of 606 completed. The team had battled back from several badly-timed Code 60 caution periods, resisting pressure from behind and always on maximum attack. The pit-crew put in a stellar performance, their hard work on #7 resulting in that car taking the finish despite its earlier travails. 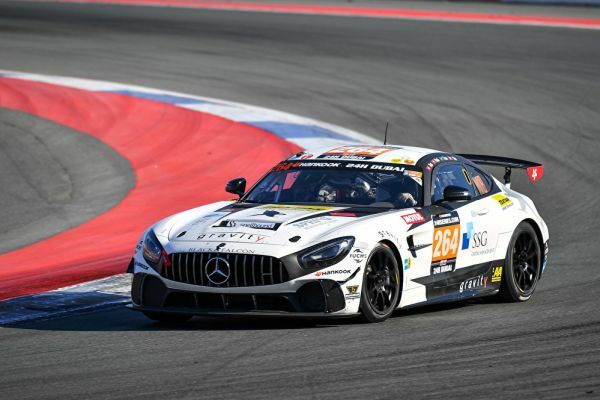 In the GT4 class, the drivers of the #264 Mercedes brought their charge home in a strong third place to take the final podium position in the class, with the sister Besagroup car finishing fourth. It’s been another incredible event for the team in Dubai. Victory is never taken for granted, and is only ever the result of hard work and total commitment by every member of the team. Team BLACK FALCON will be carrying forward this positive energy into the 2018 season and their programmes in the VLN, Blancpain Endurance Series and more appearances in Creventic-organised endurance events. You can support Team BLACK FALCON across all social media platforms: follow the team via twitter.com/TeamBlackFalcon, facebook.com/teamblackfalcon/ and instagram.com/teamblackfalcon to get updates on the team’s activity and preparations for the season ahead.